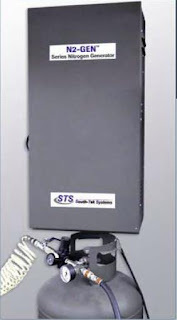 The N2 GEN Nitrogen Gas Generating System, designed and manufactured by South-Tek Systems, is a leading compact Nitrogen Generator used by the US Military for a variety of purposes including ground systems, optics, and mobile units. The N2 GEN gear provides the ability to continuously produce high purity Nitrogen from air, using a portable system, eliminating the need to bring in or supply high pressure Nitrogen storage tanks. There are numerous benefits of this system for military applications. The STS N2 GEN drastically shortens the logistics tail for supplying necessary Nitrogen, and saves money in the process. Sites achieve ROI of less than 1 year vs. high pressure cylinder supply. No soldier ever has to wait for the supply chain to catch up; N2 GEN eliminates dependence on a local supplier for their Nitrogen needs. The supply is produced from thin air, so it is unlimited and can be produced wherever and whenever it is needed. We can provide Nitrogen Generation systems in a variety of configurations and set ups depending on the application and location. South-Tek Systems is a certified GSA supplier with their Nitrogen Generator systems available from GSA Advantage and the DOD EMall. The N2 GEN unit completed an EMIP review in 2009 and was shown to improve capabilities in safety as well as reliability, maintainability, and sustainability (RMS). Contact South-Tek Systems to learn how the compact, portable N2 GEN can help your particular need for supplying Nitrogen Gas: 888-526-6284.